If you’ve ever glanced at the fascinating and diverse range of safaris available to travellers, you’ll know that there’s plenty to enjoy when you head out into the great outdoors. While this can represent a once-in-a-lifetime travel experience, however, it’s important that you prepare thoroughly for a safari holiday and take proactive steps to remaining as safe as possible. Deciding what to pack is one of the most important considerations when preparing for a Kenyan safari, and there are several things that you need to keep in mind here. Ultimately, the clothing and accessories that you bring to Kenya should be strategically selected, in order to suit your itinerary and the unique activities that you intend to enjoy. This is particularly true if you intend to travel by canoe or want to fish as part of your holiday, as this will require you to pack waterproof garment that are also breathable. In general terms, you’ll also need to pack clothing that’s loose and comfortable, as this will enable you to enjoy extended hikes and driving safaris in high temperatures. On a similar note, we’d also recommend that you understand what type of climate to expect during your holiday. The weather conditions in Kenya (and indeed Africa as a whole) vary considerably between the dry and wet seasons, so it’s crucial that you manage your expectations and pack accordingly. If you’re a fan of bold colours and gaudy Hawaiian shirts, you may need to amend your sense of style before landing in Kenya. The reason for this is simple; as bright colours tend to provide a stark contrast with the Kenyan terrain, and this can undermine your safety when viewing predators at first hand. Instead, favour pallid and neutral colours that meld seamlessly with the African bush, as this will provide you with genuine peace of mind and hopefully create a stylish camouflage look. Of course, nobody wants to be told what to wear, or dilute their passion for bold and vibrant colours. This is a must when heading out on safari, however, for the safety of both yourself and your travel companions. If you’re worried about the cost of buying more clothes, then check out our article on ways to save money travelling. Many locations in Kenya will combine soaring temperatures during the day and cooler weather at night, particularly at the peak of the dry season. This is most notable in the Great Rift Valley highlands, and popular safari locations like the Masai Mara and Lake Nakuru. As a result, it makes sense that you commit to packing different layers of clothing, including a warm layer and cosy nightwear for the evening hours. Along with base garments such as T-shirts and loose trousers, this can create a minimalist but functional wardrobe that offers genuine value. By packing cleverly and strategically, you can make the most of your safari adventure while also ensuring that your suitcase is as light as possible. There are numerous must-see sites in Kenya but no Kenyan safari would truly be complete without a visit to Giraffe Manor and the good news is that many reputable holiday companies offer stunning Giraffe Manor accommodation trips – but be warned you may have to book a while in advance owing to the growing popularity of the site. 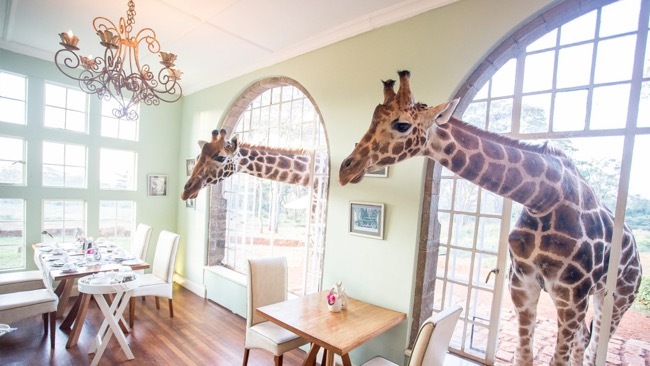 Located in Nairobi, this gorgeous old manor house has history and an uplifting atmosphere, and you’ll be joined for breakfast by many long-necked friends plus other exotic animals that inhibit the grounds.